Hawaii Ocean Animal Pen (Aquarium) is one of the new animal building that will be introduced in the new FarmVille farm extension the Hawaii Paradise. It will hold the soon to be released group of ocean animals. 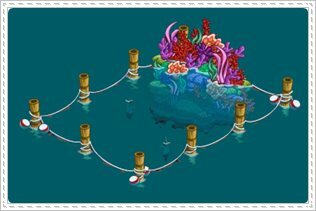 The Hawaii Ocean Animal Pen can be upgraded. The more number of upgrade it have the more number of animals it can hold. Harvesting the animals inside the pen will also count to animal mastery and for quest as well. Reminder: This feature is unreleased and the picture may vary and change. For the initial build you will need Corals, Buoys and Filters.